Made from 145 gsm. 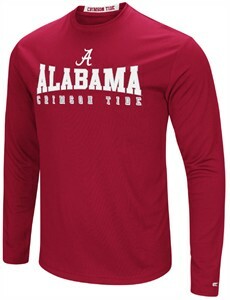 100% Pique Mesh Polyester to keep you cool and dry at the game or at the gym this Alabama Crimson Tide Mens Long Sleeve Streamer T Shirt from Colosseum comes in team color Crimson so everyone will know which college team you yell for at gametime. Made with a regular fit body that gives you room to move but drapes nicely on your body this T Shirt features a front Rubberized NCAA Team Print.